Line an 8x8-inch baking dish with foil; coat foil with cooking spray. Place popcorn evenly into dish. Melt butter in a large saucepan over medium heat; stir in brown sugar and water until combined. Cook mixture, without stirring, for about 8 minutes or until the hot syrup is a deep golden brown. Stir in vanilla and baking soda until combined. Working quickly, pour hot toffee evenly over popcorn. Sprinke cashews over the top. 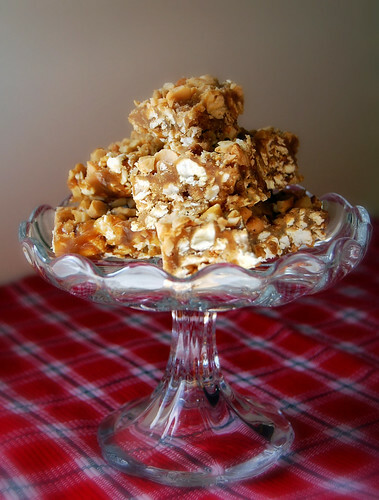 31 comments on "Cashew-Caramel Popcorn Toffee"
Happy festivus to you too!! 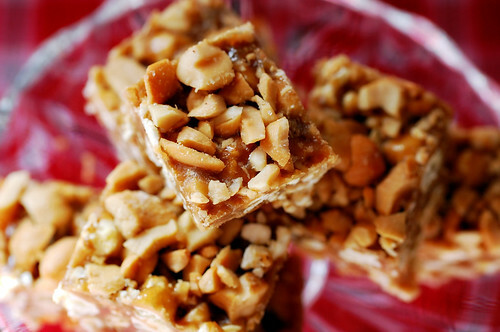 Gotta try that recipe, toffee anything is awesome but throw popcorn in the mix and i'm sold. have a great xmas! Best toffee EVER - love the flavor combination. Does this happen in your house? As the kids get older, Christmas get later and later! MERRY CHRISTMAS! I hope it's a great one. ooo girl that toffee looks good! looks like youve been BUSY in the kitchen :) have a great christmas girl! Yum! This popcorn toffee looks awesome! Chocolate PB Ritz? Have you posted that recipe?? Merry Christmas to you and yours! Hope you had a wonderful Christmas! All your goodies look great. I made those pb Ritz, too. Did you also put mallow creme in them? If not, they are even more heavenly then! And the toffee--look de-lish! I love any sort of popcorn! I hope you had a wonderful Christmas! A festivus for the rest of us! These treats look so great. I love the salty sweet crunchy combination. Looks amazing girl! I absolutely love the whole salty and sweet combo with popcorn. This recipe looks absolutely amazing. I hope you had a wonderful holiday! Hi Kellie. Thank you! It's a hand-me-down. The flag is on my boyfriend's wall, year round. There's no need for a recipe! Peanut butter spread on Ritz, dipped into melted chocolate or chocolate bark. I like to use the chunky peanut butter. This popcorn sounds awesome! Love the addition of salty cashews. Very nice photos too! Chocolate covered Ritz sounds waaaayyy too yummy. Did you gave those to Santa?! If he tasted them I'm sure he gave you the best presents ever! Hope you're enjoying the holidays! oh my, you continue to whip up one decadent treat after another ;) hoep you had a wonderful christmas!!! Looks delicious Emily. Hope you had a great Christmas!!! If your family does't love those cookies, there is something wrong with them. I love your toffee too. Hope you had a great one and a great new year on top of that! Rastafarian flag, delicious munchies, it's all starting to make sense. I never even knew the Rastafarians had a flag! You are a master of of baking and candy-making! Lovely presentation, and wish you a prosperous New Year! Gorgeous photos! Love the new look of your site! and I like to open presents at midnight christmas eve/day... can't believe yours are all still open at 1am! Hope you had a Meery Xmas Em, and wishing you a fabulous 2010. 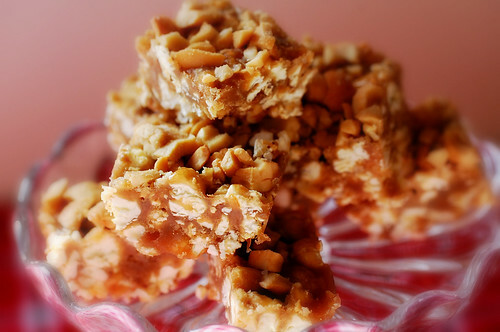 Love the popcorn toffee recipe - sounds delish. Mmmm, this sounds so interesting and good. Where do you get all these ideas? Any leftover? Send me some! I'm just getting around to catching up on all my favorite blogs now. I had to comment when I saw your Santa Claus cookie cutter - the one where he's carrying the bag of toys. My family and friends get together every year to decorate sugar cookies and this cookie cutter is always included - except that it rarely actually gets decorated as Santa. It's been a christmas turtle and a christmas snail before, and almost every year someone ends up making it into a yellow submarine. Glad you enjoyed the holidays! As for me, I am going on a diet now, but am certainly not cutting out my favorite baking! What a unique and delish looking toffee! After reading your this post, I really can't wait til Xmas!!! What do you think...about adding crushed bacon pieces?